Today was my "at home" play day. 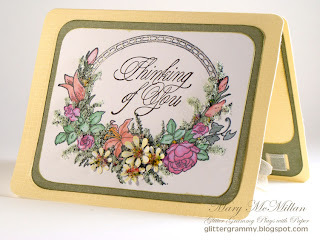 I've been reading about Flower Soft and yesterday Karen of Paradise Scrapbook Boutique lent me a video that showed many uses for Flower Soft. I must say...I was hooked. Karen will have Flower Soft products available SOON.....Karen was kind enough to let me play with two sample colors - Pale Green and Spring, and the Flower Soft Adhesive. The video stresses using a thick glue that dries clear. I'm heading back to my craft room.....I'd like to play a little longer. See you next time. The flower soft looks so pretty on this wreath and the popped up flowers are great, very lovely card!